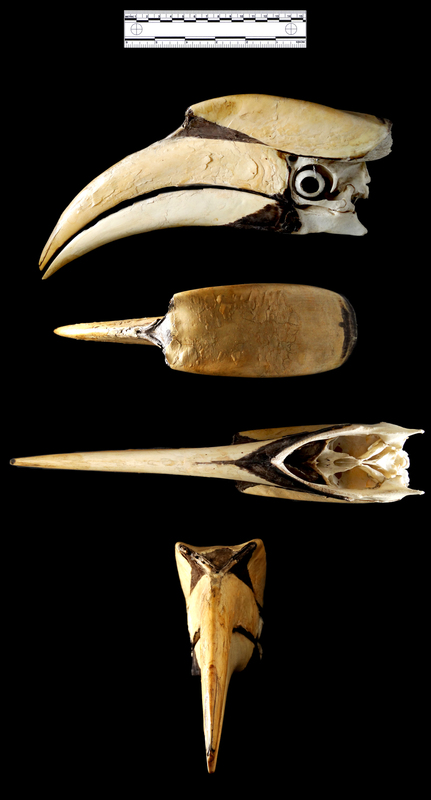 Many of you recognised that this is the skull of a Hornbill, and Martin Edvardsson, ClareP, Jamie Revell, paleomanuel, witcharachne, marcuschua all managed to identify it as a Great Hornbill Buceros bicornis Linnaeus, 1758. You may be surprised to know that this specimen was originally misidentified as a Black-and-white-casqued Hornbill Bycanistes subcylindricus (Sclater, 1870) by the taxidermists who prepared it – quite a basic error for a natural history professional! The Great Hornbill is a large Asian bird that feeds on fruit and any small critters that end up at the wrong end of that impressive bill – from insects to owls. Their distinctive black and white plumage is used by a lot of native people in Southeast Asia in costume, leading to pressure on the bird’s population due to hunting. There was a healthy discussion about possible identifications, with the importance of scale mentioned more than once (by Jake, palaeosam, Lena and Robin Birrrdegg). 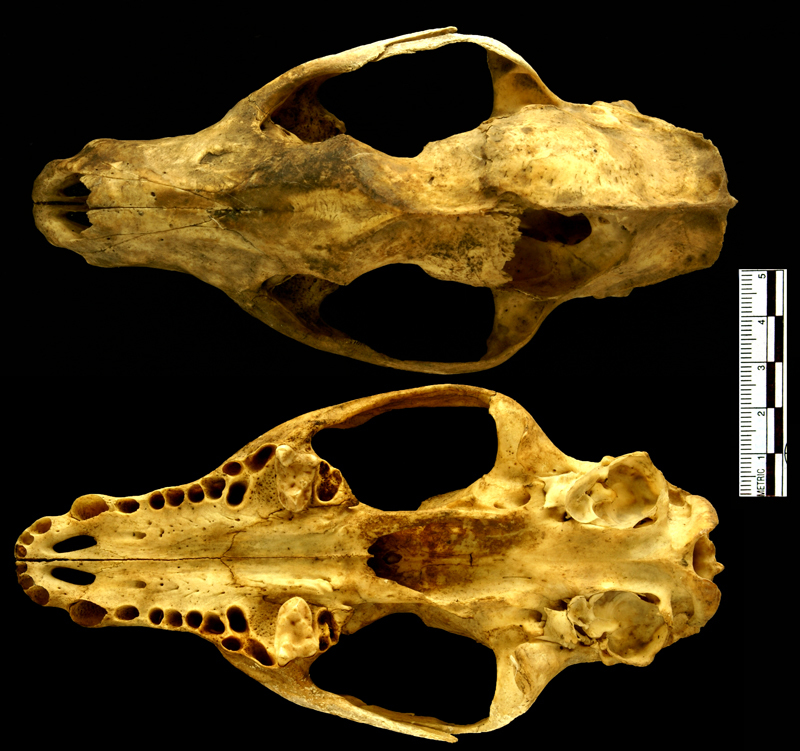 Not only is this a robust skull, it’s also quite large, ruling out the British carnivores – and it clearly is a carnivore judging by the canines and the well-defined sagittal crest. 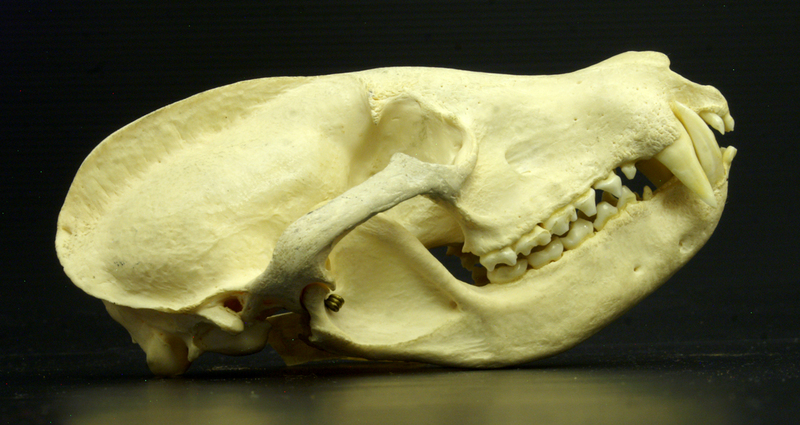 The lack of cutting and puncturing premolars and molars means that cats, dogs, hyaenas and other very carnivorous large carnivores can be ruled out, narrowing down the likely options in the right size range to the bears, as recognised by palaeosam, Ric Morris, Robin Birrrdegg, Will Viscardi, cromercrox, cackhandedkate, Lena, Daniel Calleri, henstridgesj and Carlos. The species is a bit more difficult to work out, but the big sagittal crest and fused sutures suggests that this is not an juvenile bear, meaning it’s too small for a bear of the Brown or Polar variety. That still leaves quite a range of other possible bears, but the pronounced forehead and long square muzzle rules out the Giant Panda, Sun Bear, Spectacled Bear and Asiatic Black Bear, while the big robust incisors rule out the Sloth Bear. 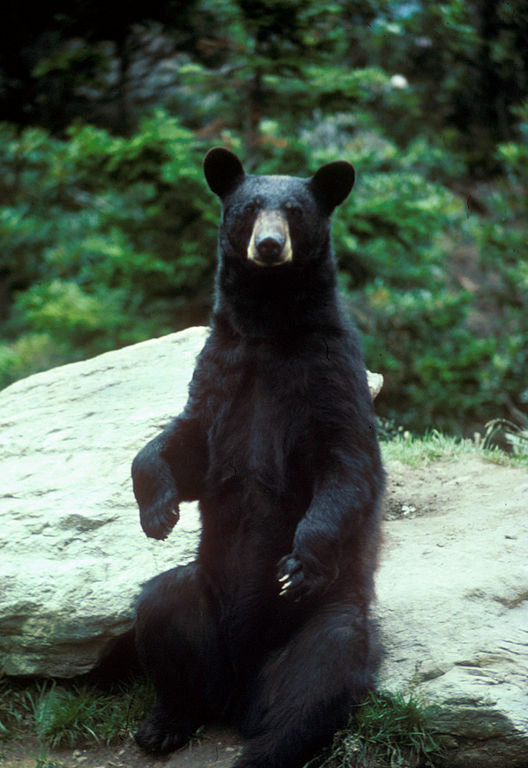 That leaves the American Black Bear Ursus americanus Pallas, 1780. So well done to cromercrox, Carlos and Robin Birdeggg who all got the species correct! I have concerns about the identification attached to this one, so let’s see if your thoughts agree with what I have written on the label. As always, you can put your thoughts below and they will be very welcome! Any ideas what this might be from? As usual you can leave your suggestions, thoughts and questions in the comments box below. As usual you can put your questions, thoughts and suggestions in the comments section below and I’ll do my best to respond. 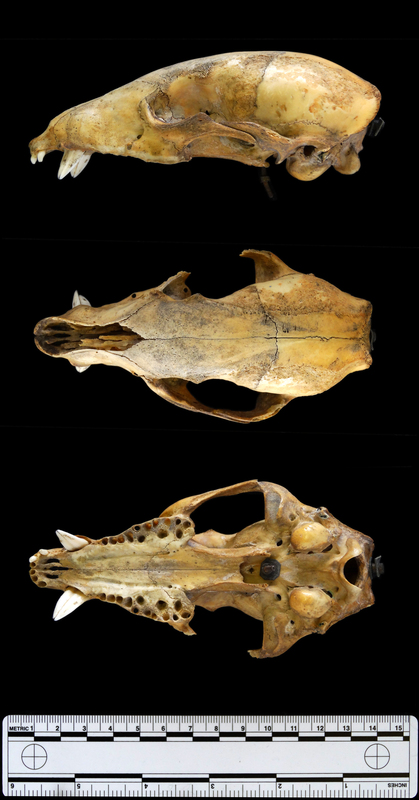 Now the gracile build could just be because it’s the skull of a juvenile (which is what it looks like), but juveniles have shorter and relatively broader facial regions than adults, so that doesn’t work. 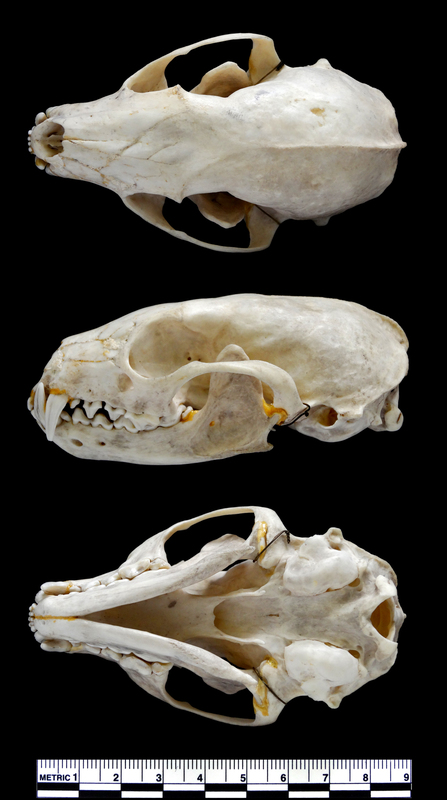 Even the less robust jaws of the Common Raccoon are too short and wide for the mystery specimen (which I think may discount Robin Birrrdegg’s suggestion). 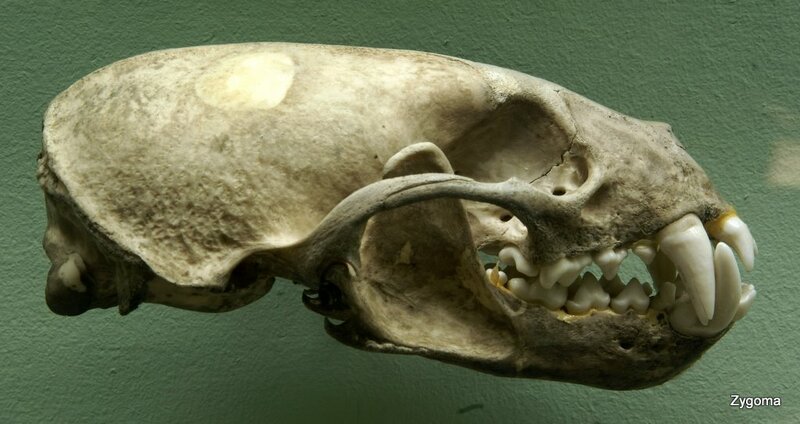 This is indeed the case and so this skull can’t be from a Crab-eating Fox. Now the specimen of Coati above is a mature male that was mystery object 54 and it doesn’t look much like our most recent mystery object, but on checking the skulls of juvenile and female Coatis I realised that this is probably the best option so far. 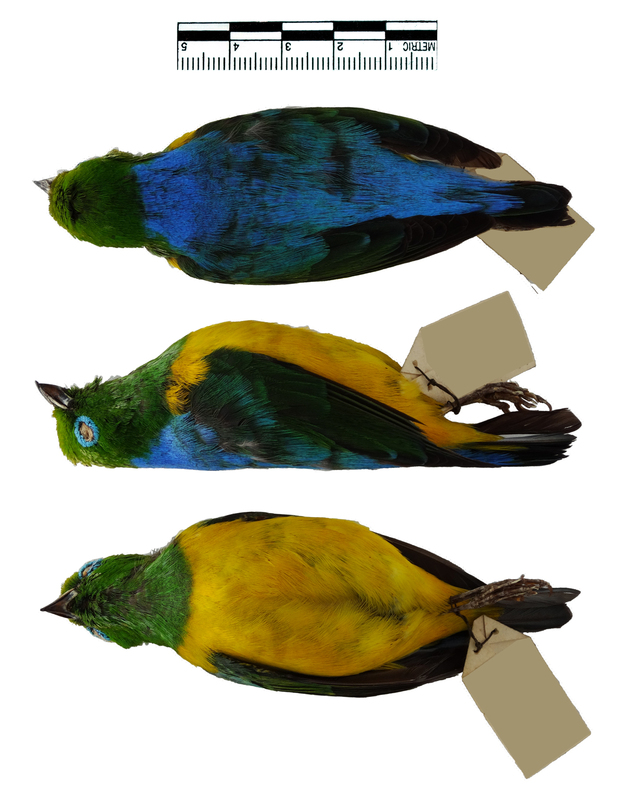 I still want to check some more specimens, but I’m really grateful for everyone’s input on this specimen – it’s been a challenge and you have all helped immensely! I’ll be back with another mystery object next Friday, but until then I’d like to wish you all a thoroughly enjoyable festive season!